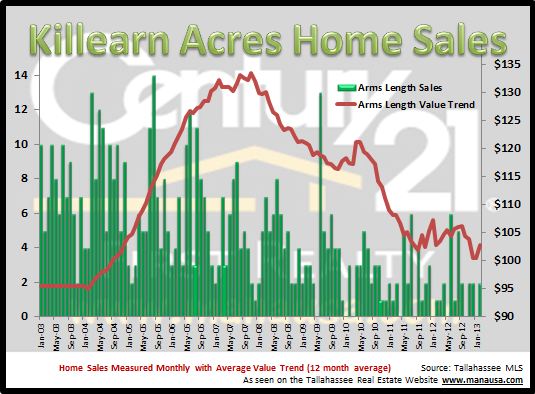 As Northeast Tallahassee begins to stabilize at the median home price level, a study of Killearn Acres is an effective way to see how the housing recovery is progressing. The real estate graph above shows that roughly 2 in every 5 home sales in Killearn Acres is either a short sale, a foreclosure, or a bank owned property sale, which means arms length home sellers are fighting against a whole bunch of distressed properties as competition. Currently, there are 12 homes for sale in Killearn Acres, and they range in price between $120,000 and $685,000, though most fall below $200,000. The value of homes in Killearn Acres has come down more than 33% since the peak of the housing market, but stabilization has been gaining ground for the past two years. Due to the relatively few arms-length home sales each month (about 2 on average), our data has a lot of noise in it. What is clear is that arms length home values in Killearn Acres have ranged between $100 and $105 per square foot since March 2011, and there are no indications that we will break from this range anytime soon. With roughly 40% of all Killearn Acres home sales recorded as distressed sales, home sellers will be fighting a difficult market. Patient buyers are getting great deals on short sales, but often are left waiting four to six months to find out if their contracts will be accepted by the bank. To compete as a home seller in this market requires a very strong internet marketing campaign, and it requires daily updates to compete with the short sales and foreclosures. If you would like to know more about selling a home in Killearn Acres, you can watch our short video on the Progressive Home Selling Plan or check out our Home Seller Resource Page with links to more than 50 different articles about selling a home in today's market.